Since its inception, American Tortoise Rescue has rescued well over 4,000 turtles and tortoises of all species with 70 percent being land tortoises and the remainder water turtles. The in-house population "floats" at about 125. 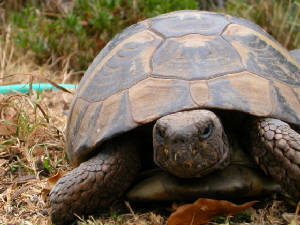 Implementing a national campaign to stop the sale of a specific species of tortoise called sulcatas, which are being mistreated and sold illegally throughout the U.S. Helping to stop the cruel sale of turtles and other exotic animals in an section of Los Angeles called Santee Alley. Because of our video presentation before the Animal Control Commission, officers now continually monitor the situation and make arrests. Bringing to light the cruel sale of water turtles in Asian markets throughout the US. These animals were kept in unsanitary, cruel conditions including upside down, without food, water, or shade. Creating a campaign called Turtle Ambassadors to teach awareness among school children about turtles and tortoises. Developing a national campaign to stop the sale of reptiles in pet stores. Producing a series of videos about turtles and tortoises, which is distributed to media and other places with large audiences.